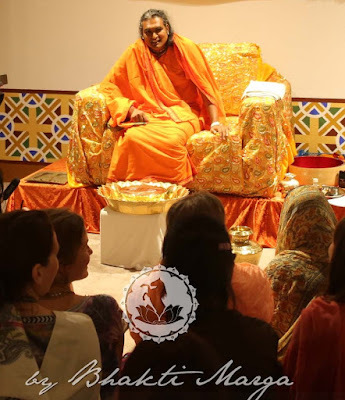 On last Friday night, more than 200 devotees of Sri Swami Vishwananda, who had come to Shree Peetha Nilaya to attend the Sri Yantra Course on the 18-19 July, received an unexpected blessing: the opportunity to attend an auspicious abishekam on Swamiji's Lotus Feet. This event took place, without an official pre-announcement, in the Light Hall of Shree Peetha Nilaya, where people started to gathered around Sri Swami Vishwananda after 22:00. 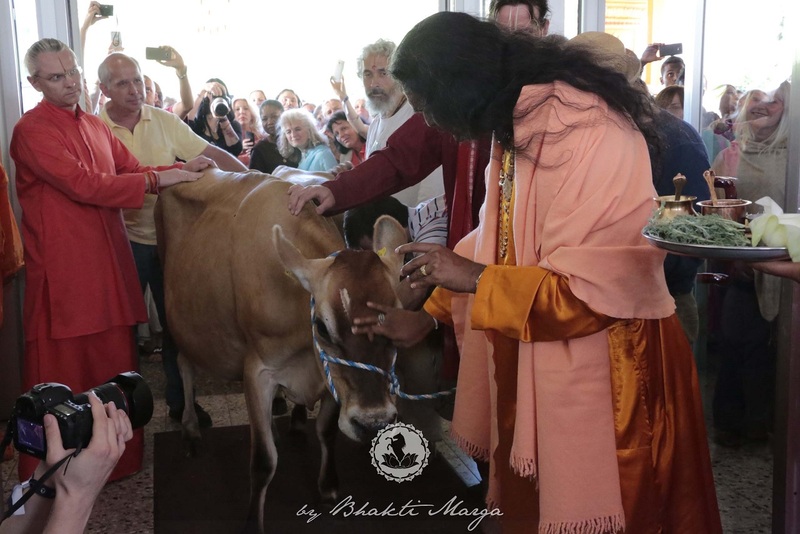 The particularity of this abishekam is that it was made with the milk obtained from the two new Bhakti Marga cows – last milking before they give birth in September. These two cows were donated to Sri Swami Vishwananda in the morning of the first day of the Celebrations of the 10 Year Anniversary of Bhakti Marga. 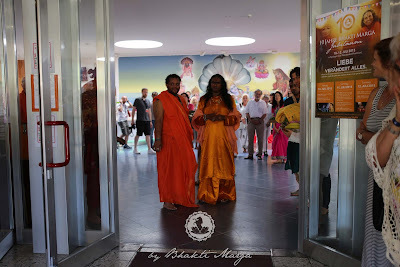 A few hundred devotees present outside of Shree Peetha Nilaya's Main Entrance, were surprised by their sudden appearance, while they were being guided towards the lobby. Sri Swami Vishwananda in the lobby of Shree Peetha Nilaya, ready to welcome both cows and to give them His blessings. 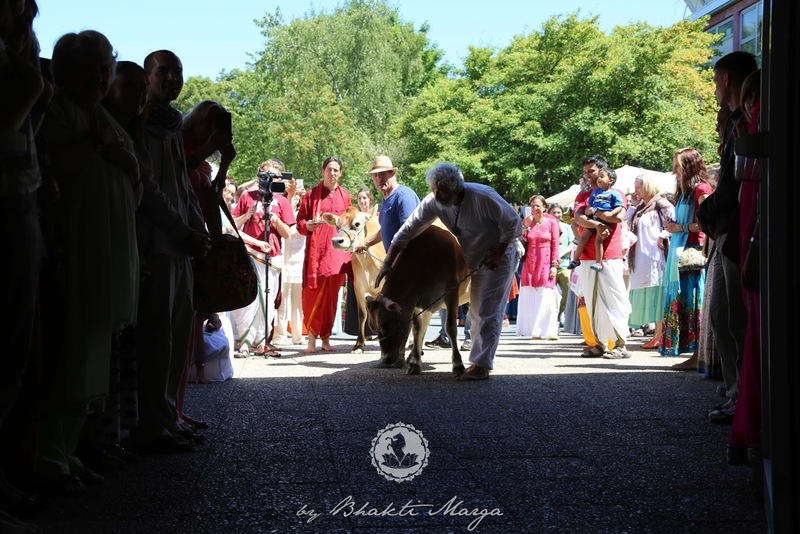 It is very auspicious that Bhakti Marga Cow Seva has begun during the celebrations of the 10 Year Anniversary of Bhakti Marga. 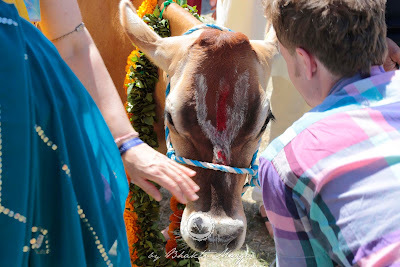 In order to have a little glimpse of the deep meaning of these auspicious happenings, let us remind ourselves of the cow's great importance in the Hindu tradition and its symbolism, in particular in Vaishnavism. 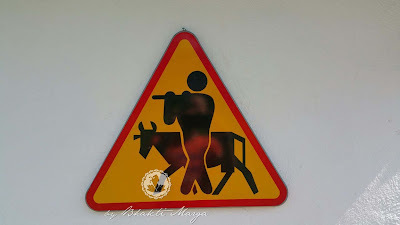 ‘Gau’ means ‘cow’ and ‘Dhaan’ means ‘donation’. 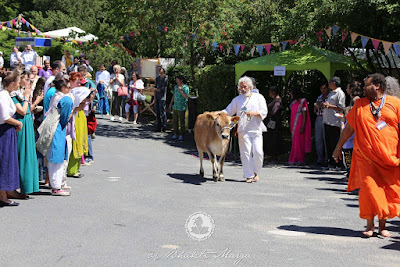 The auspiciousness of cow donation is known since ancient times, when cows were donated to brahmins, in particular by kings, whose duty was to support the good functioning of the ashrams. The cows provided the products – milk, yogurt, ghee, urine and dung – which were needed to perform the Hindu rituals of worship, like puja, abishekam and yagna. 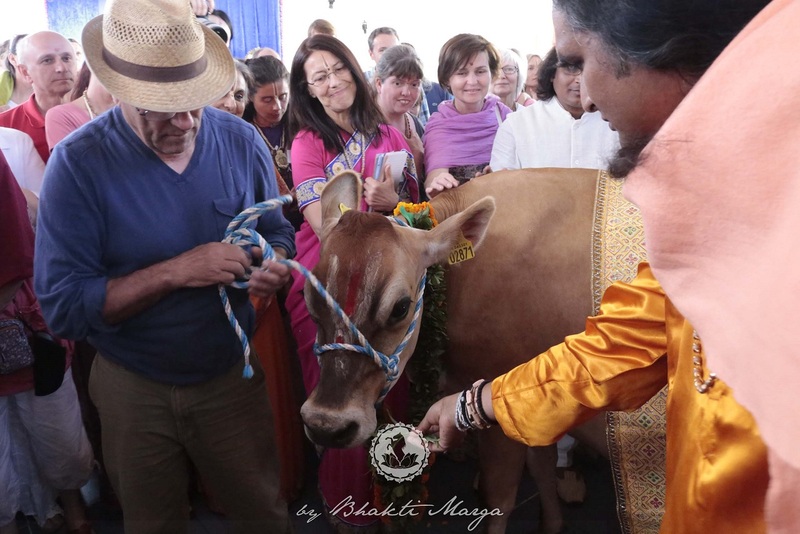 In Vaishnavism, the donation of a cow it is considered to be the second highest form of donation which someone can give to a Guru (first being one's own surrender), and its benefits are endless. ‘Gau’ means ‘cow’ and ‘Mata’ means ‘Mother’. In the Hindu scriptures the cow is referred to as Devi and Mother Earth, the ever-giving nourisher, providing for all and sustaining the life of all creatures. In the Hindu tradition, all cows are considered to be the earthly embodiment of Kamadhenu (also referred to as Surabhi), the miraculous ‘cow of plenty’ or ‘wish-fulfilling cow’ and ‘mother of all cows’, who came out of the Churning of the Milky Ocean. She is commonly depicted together with her daughter Nandini and is a symbol of abundance and prosperity. 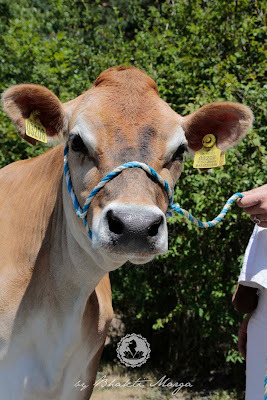 The cow is a symbol of gentleness, maternity, selfless service, loving-acceptance, tolerance, strength and endurance. The cow milk and dairy products are a major source of nourishment; the cow dung is a source of fuel and is also used as fertilizer and disinfectant; its urine is used for medicinal purposes. By venerating the cows, people are inspired to develop these qualities. Govinda - ‘Go’ means ‘cow’, ‘land’, ‘senses’ and ‘vinda’ means ‘pleasure-giving’; whenever and wherever Lord Krishna appears, everything becomes very satisfying and pleasing. Gopala - ‘Go’ means ‘cow’, ‘land’, ‘senses’ and ‘pala’ means ‘protector’, ‘guide’ ; the one who captures our senses, protects, and guides our souls towards the ultimate goal: supreme Love. 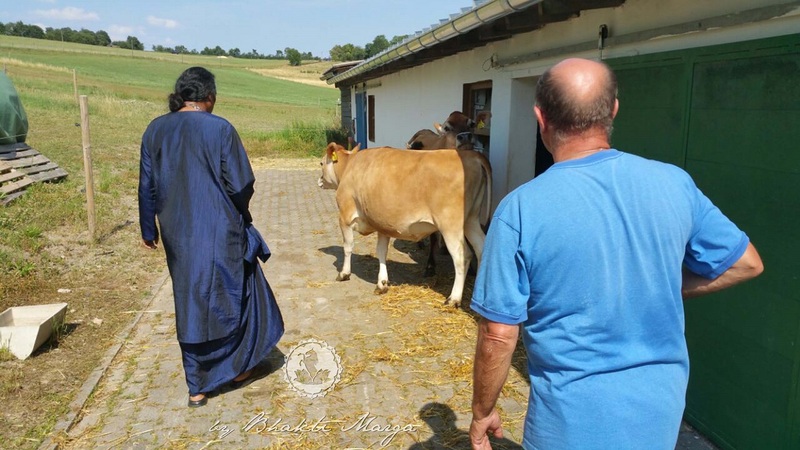 A true Satguru like Sri Swami Vishwananda is an embodiment of Lord Krishna Himself. There is no difference between the Satguru, the Supreme Lord or the Supreme Love. Therefore, the Satguru Himself is Govinda and Gopala. "All the organs of the body are represented in the feet. In reflexology, it is shown that the feet represent the whole being. That’s why wherever we go, we touch the Feet of the Master; we are focused on the Feet of the Master; we surrender to the Feet of the Master. The book of Sri Swami Vishwananda's Shreemad Bhagavad Gita Bhasya is just recently off to the printers, and will be available for purchase by Gurupurnima! We're also publishing 108 videos of the Shreemad Bhagavad Gita course on our YouTube channel between now and Gurupurnima - check those out here.